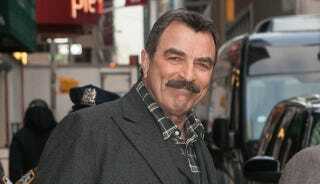 Tom Selleck was busted by the water cops in Southern California. Despite the Golden State’s severe drought, it seems the Magnum P.I. star has had “truckloads” of water from a public hydrant delivered to his ranch. Magnum! The Calleguas Municipal Water District filed a complaint against the Blue Bloods actor—you know, the other cop show he’s on with Donnie Wahlberg—stating that Selleck’s orchestrated over a dozen water hauls to his Hidden Valley ranch since 2013. According to the LA Times, this action is theft because Selleck’s water tap is in a different county, and he and his wife Jillie have repeatedly ignored cease-and-desist letters from the Calleguas district. The district even hired a private investigator to catch Selleck’s water trucks in the act, which it did as recently as last March. Now Calleguas water district wants an injunction barring the couple and whomever may work for them from their fountains. Selleck’s people had no comment, presumable because they are wondering just how much drought shaming is too much drought shaming to remain a good guy in the court of public opinion.